These European Bee-eaters are migratory birds and are found as far south as South Africa. I believe that they fly non-stop from Europe – no mean feat indeed! 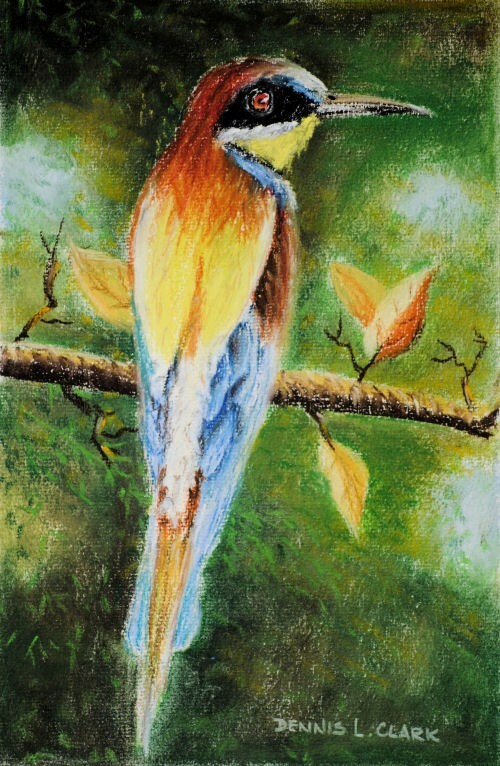 Their plumage is very colourful and you will be drawing this one in Soft Pastel. 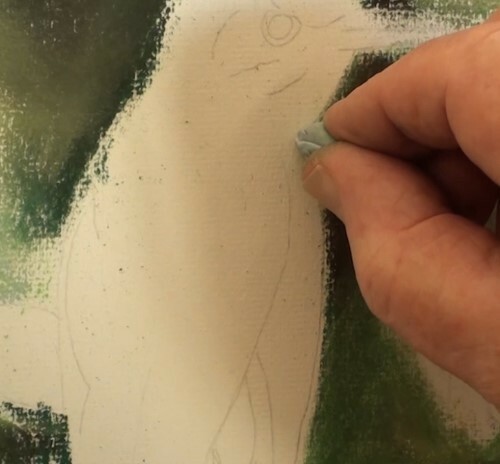 Trace your template onto the pastel paper after rubbing graphite from a 3B or HB pencil over the back of the template. 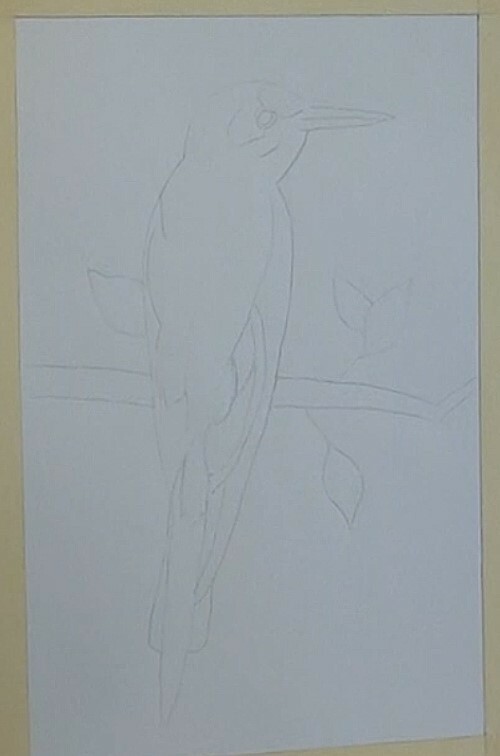 Make sure that all the outlines are covered with the graphite. 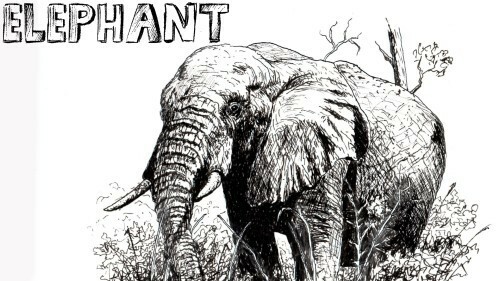 Use either a ballpoint pen or a hard pencil to trace the outlines. 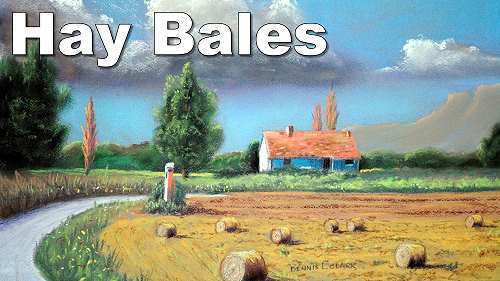 Add in the patches of sky with some blue and then, with a dark green, start adding in the dark shadows in the foliage, as well as those in the upper part of the painting. The best way is to work from the back to the front. 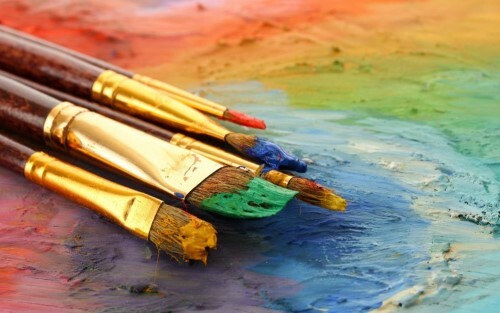 In other words, work from dark to light, As each subsequent lighter colour is applied over the lower colour, it forms the law of overlapping. This very dark is the underpainting to all this foliage. 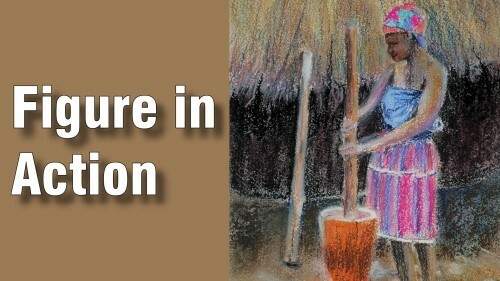 Use a blender to push the dust into the paper. You may also use a ball of BlueTac or Prestik to do the same thing. 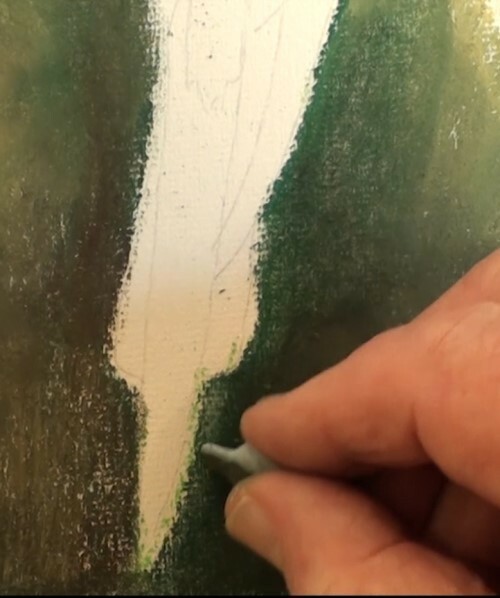 Push the pastel dust right up to the light pencil lines. 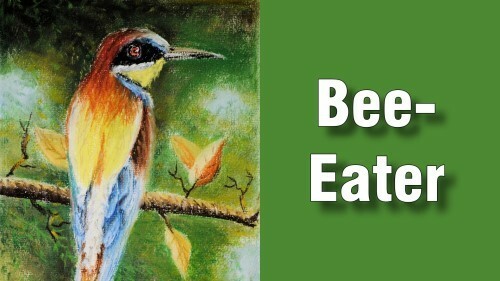 Do the same here in the lower section of the Bee-eater. Observe how the line above the hand has been nicely sharpened up. With some light green and yellow ochre add some random markings into the foliage area. These are preliminary marks. Leaves are not always green. 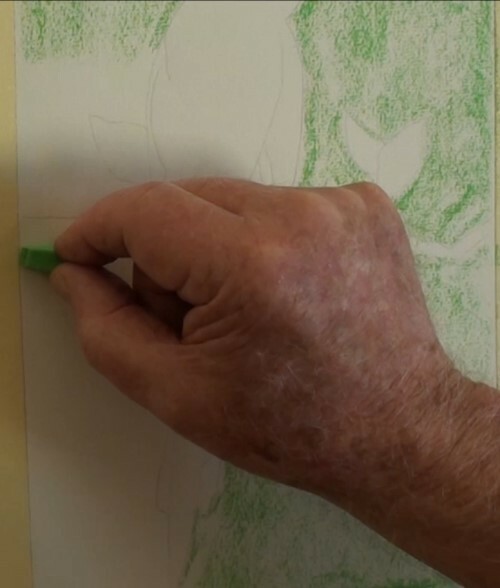 Use a light yellow ochre type colour to first block in the leaves. 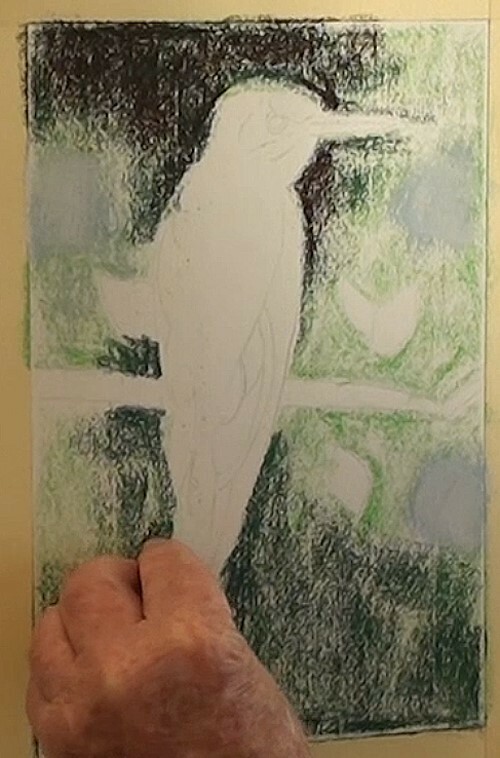 Then with a very light pastel block in the nearest leaf. With a brick colour complete the leaf as shown. Then add the delicate veins in the leaves. 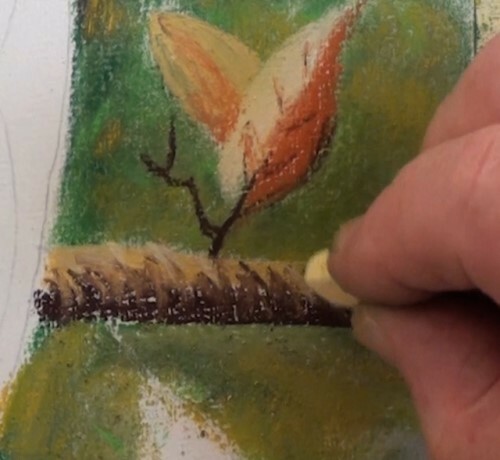 Add the shadow of the branch with a dark brown. Paint the eye with a red pastel and add a touch of yellow to the lower part of the circle. 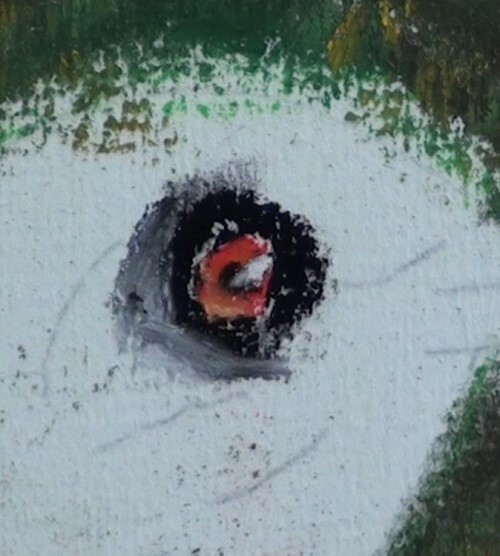 With the edge of a black pastel, carefully add in the pupil – keeping it circular. Add some black markings around the eye and with the Blue Tac shape into a point, blend right up to the eye. 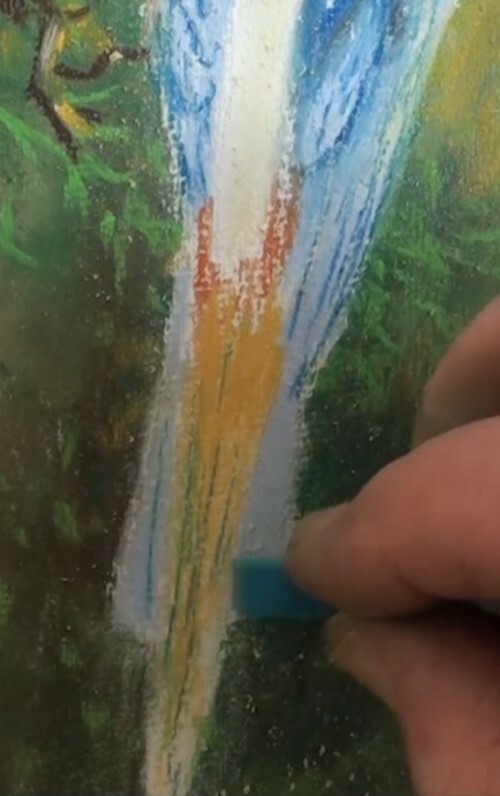 Add the eye highlight in with the edge of a piece of soft white pastel. 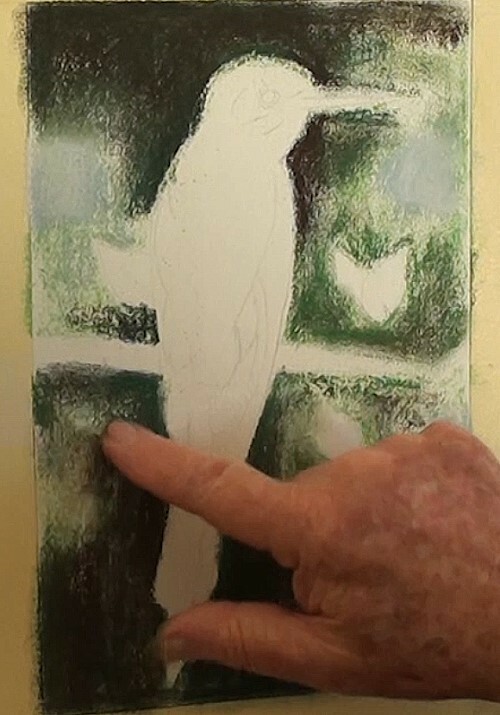 Begin by adding a light yellow under the chin as well as the back of the bird. 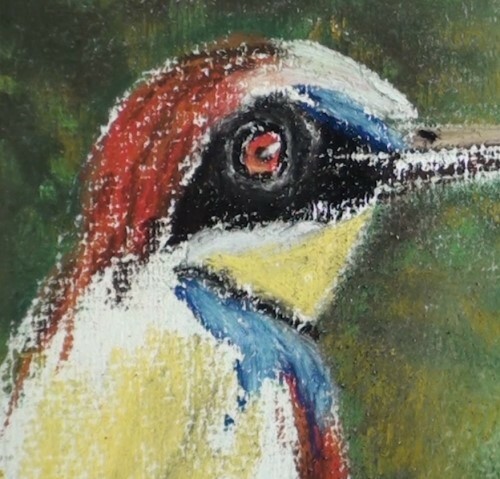 Paint the black area around the eye and the black of the lower beak. Add the black collar. 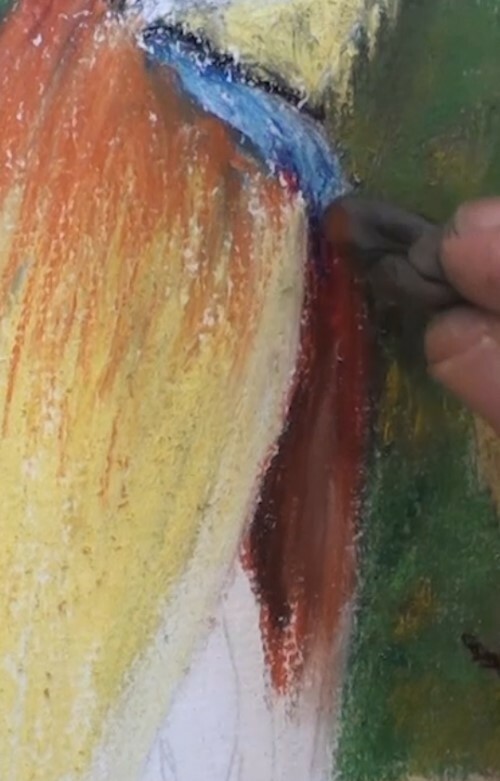 Stroke in the burnt sienna colour on the top of the head and the portion of the chest. Add some light blue to a portion on the forehead and the blue “bib” below the neck. 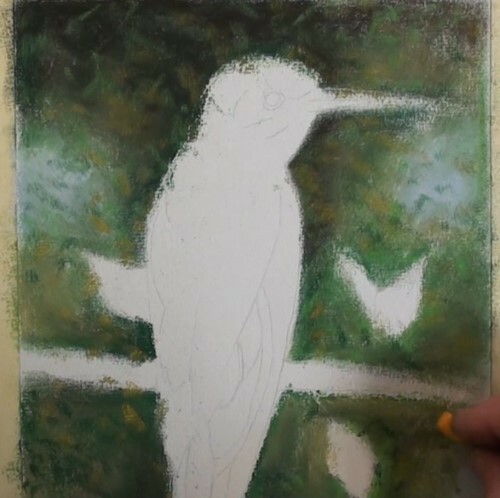 Begin to blend and smooth out the colours. Lightly stroke in some of the burnt sienna over the back into the yellow. 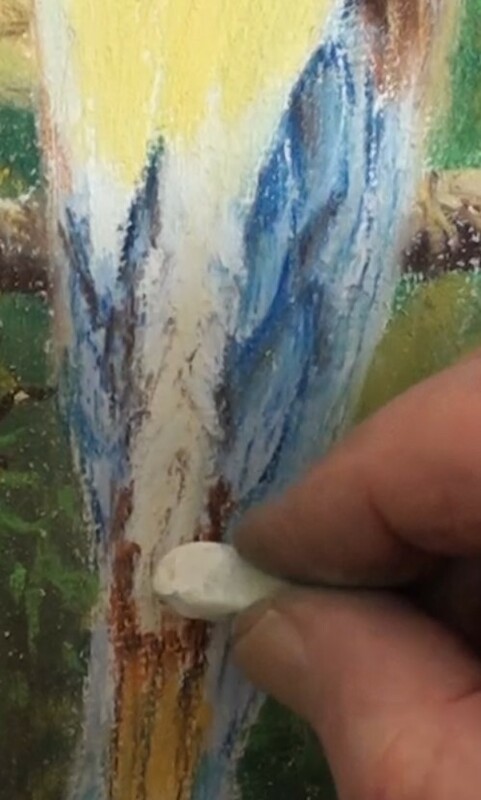 Start to edge off the wing edges with a bright blue such as ultramarine. Still using the ultramarine blue, lineate the feather edges. 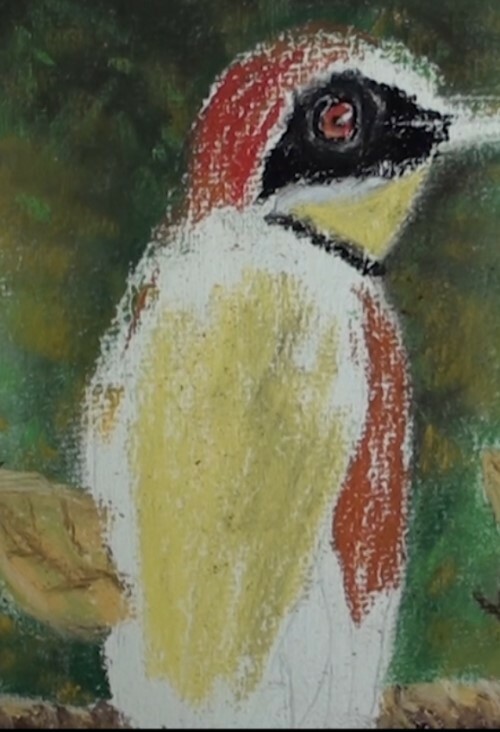 The darker stripes are where the one feather is above and over the lower feathers. Leave the light line of the centre feathers. 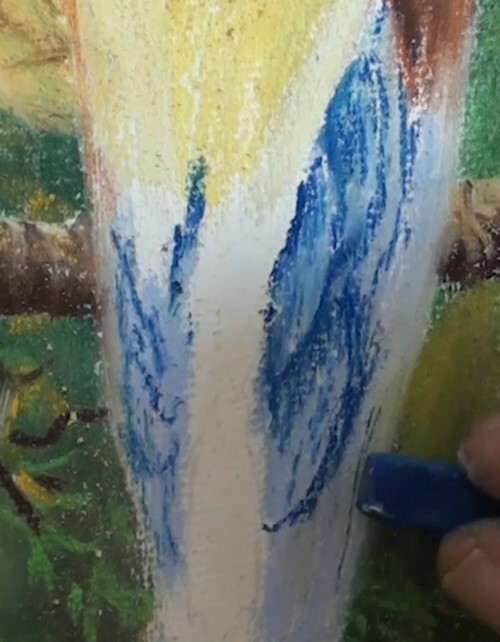 With a lighter blue, detail the tail feathers. 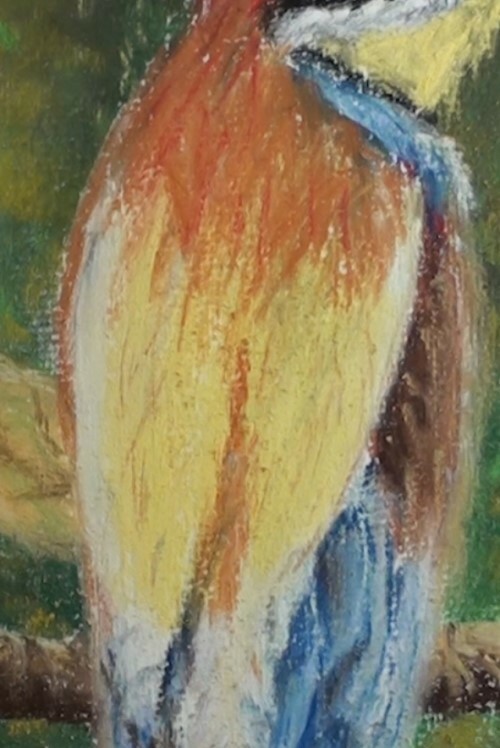 Add the yellow/orange centre feathers with a touch of Burnt sienna near the tips of the wings. With a soft white pastel mark in the centre tail stripe. With burnt sienna finish the detailing of the tail feathers. 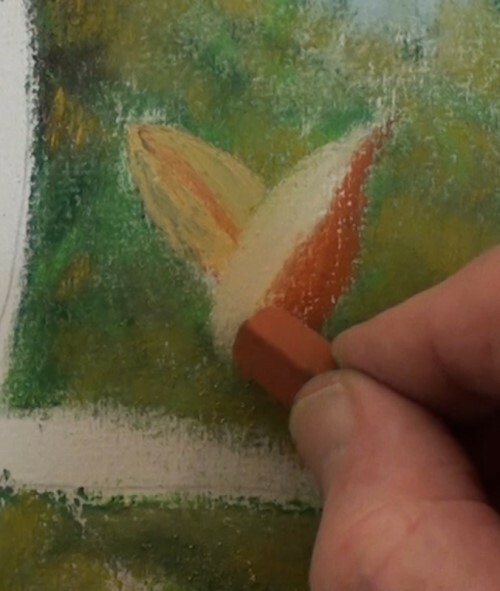 Finish off the body details with some burnt sienna pastel.